Much of a child’s school success depends on how well they do their homework, which in turn depends on his of her time management skills. A child should be taught how to get their homework done within a particular time frame and have time for recreation afterwards. Procrastination can be defined as a type of avoidance behaviour, which is characterised by the deferment or “putting off” of tasks or actions to a later time. This can have a negative impact on a child’s education and many parents cannot understand why their normally smart child is doing poorly with homework. A child may exhibit the signs of procrastination if they regularly do not hand in homework on time, fail to study for tests until the last minute or generally appear to be lazy about getting started on homework tasks. Lack of routine – If your child does not have a routine that they follow daily they may find it more difficult to settle down to do homework. Enforce a regular schedule and your child will know what is expected of them. Needing a change of routine – All children are different, and it is important to remember that what works for one child may not work for another. 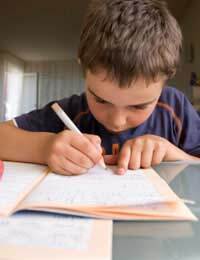 One child may prefer to do homework straight after school whereas another may work better after a meal or play time. Needing a better place to do homework – Ensure the area that your child does their homework is comfortable, quiet, and free of distractions. Have all the supplies that they need to complete their homework within easy reach. Learning difficulty - If you suspect that your child may have a particular learning difficulty they may need special help. This should be discussed with your child’s teacher to establish whether or not they have perceived the same difficulties. Help your child to focus on just one task/action at a time. Your child may feel overwhelmed when they look at everything that they need to get done. Select one thing to do, and do it well before moving on to the next task. Allocate a specific time for getting each task done. Try using a kitchen timer or alarm clock. Teach your child to ignore everything else. While they are being timed they should not be focussing on the clock or wasting time sharpening pencils, getting a snack, answering the phone etc. Breaks should be avoided until the task is finished. Reward your child. If they worked hard to complete the task reward your child with something they enjoy e.g. some time to read a book or time on the computer. As a parent/carer you can teach your child good habits in planning for both long term and short term projects, which will benefit them throughout their lives. It is helpful to remember that what works for one child may not work for another. As a parent/carer you should not procrastinate either - work with your child to find out the problem that is causing them to do poorly with homework, and once your child sees that you care enough to search for a solution they may be more willing to open up and cooperate with you in finding the answer.